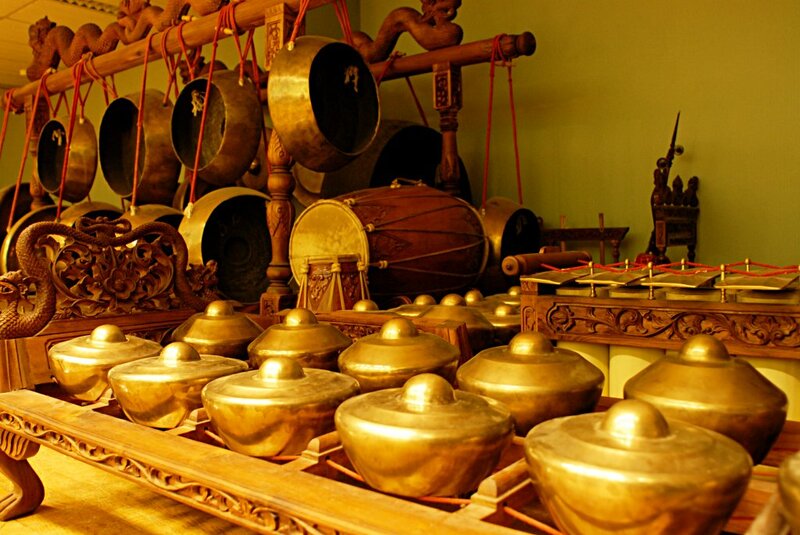 The Gamelan is the musical instruments. In the Javanese Wayang, these instruments nowadays consist of at least 15 different types, mostly made of bronze and generally of the percussion type, mostly made of bronze and generally of the percussion type; a small bamboo flute (suling), one or two horizontal drums on wooden stands (kendang), a two stringed violin-like instrument (rebab) and a wooden xylophone (gambang) are the non percussion and/or non-bronze musical instruments used to accompany a wayang purwa performance. The kothak or wooden chest. The kothak normally functions as a storage box for the wayang puppets and other equipment such as the kelir, chempala and kepyak. To store a professional set consisting of around 200 puppets, its measurement should be approximately 150 cm. long, 80 cm. wide and 60 cm. high (with lid on). The chempala or wooden knockers are usually made of teak wood. There are two kinds, one about half size of the other. The larger of these is approximately 20 cm. long with a diameter of about 5 cm. This is usually held in the dalang's left hand, is used to knock the kothak to produce the sound effects and coded orders he requires. When his two hands are busy manipulating the puppets, he uses the small chempala for the same purpose by holding it between the toes of his right foot, for he sits cross-legged, his right foot crossing his left thigh. As mentioned above, the knocking sounds not only produce sound effects, but also serve as the coded orders/signals of the dalang, orders to the musicians on what melodies to play, to slow down or quicken the rythm, to play it loudly or softly, or stop the music. The kepyak or metal rappers. This is usually made of three pieces of bronze plate measuring approximately 15 cm. long and 10 cm. wide suspended on small cords or chains to the outer side of the kothak. The dalang hits it with the toes of his right foot or with the small knocker held between the toes of his right foot. The function of this tool is mainly to produce sound effects; occassionally it functions as a chempala in giving the coded signals. This material is taken from Pandam Guritno, Wayang Purwa Program (Festival of Indonesia: USA 1990-1991), Indonesia: Studio'80 Enterprise, 1991.